Aleyna is the strongest person most people will ever know. In her short life, she has had to deal with epileptic seizures, and strokes (caused by the trauma of the seizures). At a year and a half old, we have done what we can to help her out and make life as safe and comfortable as possible. We have made the choice that in order to make sure Aleyna is safe, her mom will stay home to care for her. Due to this choice, there is rarely extra money for what any “additional” items above the everyday necessities. 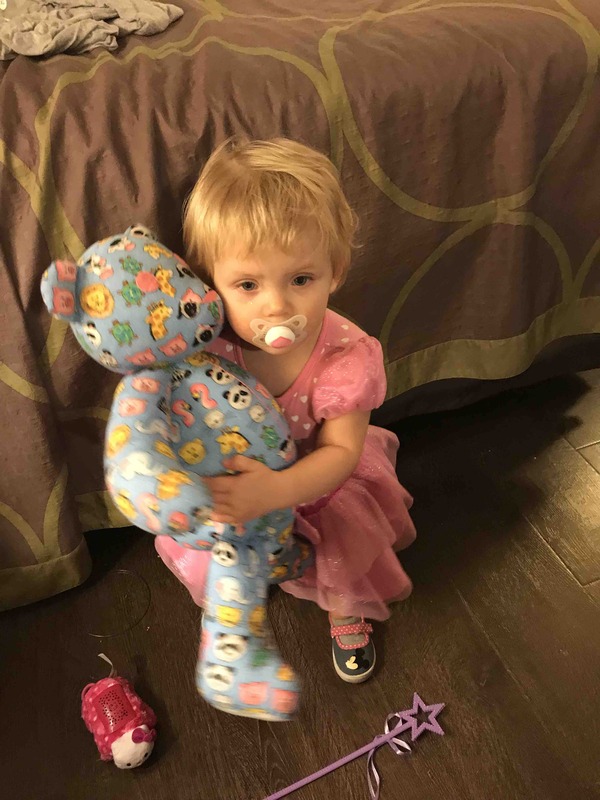 At this point, the only thing that the doctors have been able to tell us about Aleyna's epileptic seizures is that they are caused by a stroke that she had when she was in the womb. They will never go away and so our goal is to do our best to manage them. 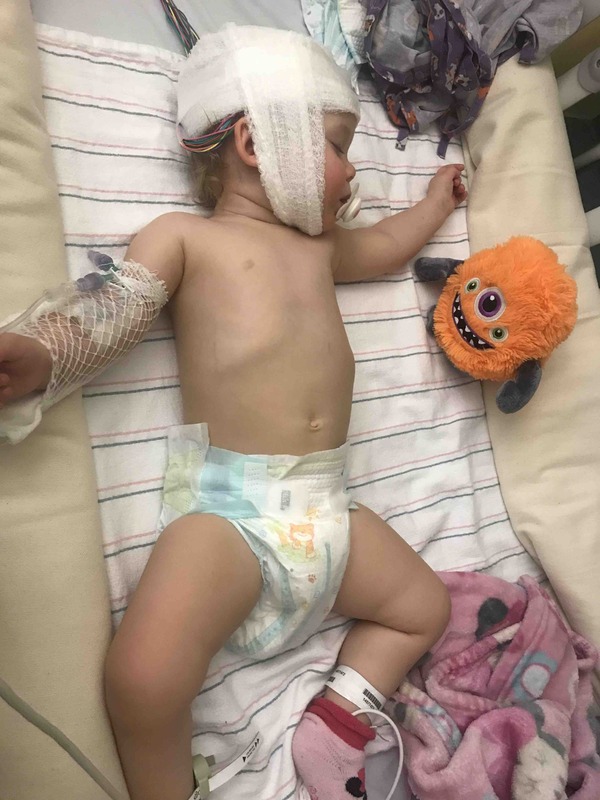 There is testing (costing around $6k) that can give us more information about her seizures but, unfortunately, the insurance considers those “elective” testing and even if we find more information, the reality is this is something she will have to live with for the rest of her life. While we work towards raising the funds for these tests, our focus has turned to keeping Aleyna safe. 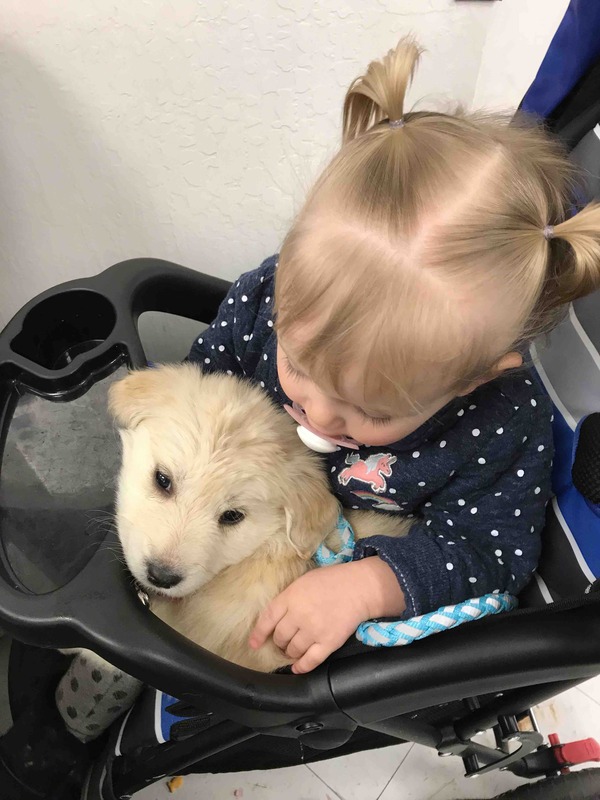 We are currently trying to raise money so we can adopt a specialized epilepsy service dog. We have decided this is the best step to keep our little girl safe. Epilepsy service dogs are specially trained animals that are able to predict seizures and help with the recovery period by providing comfort. Each dog is able to focus specifically on the person that they are trained to provide their specialized services for. Epilepsy service dogs are trained to reduce the seizures by knowing what stressors cause the seizures and assisting with comfort during those times as well as attempting to guide the person away from those stressors. This animal has the distinct possibility of saving Aleyna's life. We have a dog that we want to train as her service dog. We recently adopted a German Shepard/Lab mix, named Elsa, that we will be training from a puppy to tend to Leyna. Our hope is to raise the $25,000.00 so that we can put the dog through all of the necessary training needed to be a good service dog. Using the money already raised, we have already placed her in general obedience classes that will include the AKC Good Citizen testing. Once that is completed (this is an approximately 4 month course) and Elsa is old enough, we will begin to sign her up for the specialized training that is necessary to certify her as a service dog. These classes are expensive and to make her the best she can be for Leyna she will require several. Additionally, we will need to pay to certify her ourselves once that time has come. Any extra money that is raised by this campaign will be used for further testing as it is prescribed by the doctors. 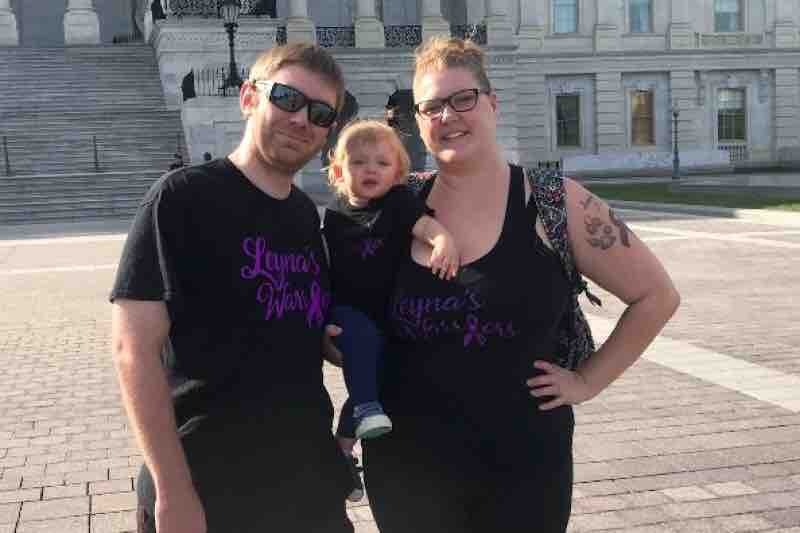 We welcome any questions and will be attempting to continue to fundraise in other ways (such as our Leyna's Warriors T-shirts and wrist bands). If you have any questions, or wish to donate directly, please feel free to contact us at leynaswarriors@gmail.com and we will respond as quickly as possible. Thank you so much for taking the time to consider our plea for help. We would like to thank CBS News for their amazing story about ours, and others like us, that are dealing with the troubles of rural health care. We appreciate everyone that helps with our problems. Further updates to come on our situation. Today, we received Elsa, a German Shepard/Lab Mix. We will be training her from a puppy (as you can see) to be Leyna’s service dog. We have lowered our amount necessary to complete this campaign to $10,000.00 as it is slightly cheaper to train our own service dog. The trainings are still expensive so we need all the support we can get. Please share our posts and get the word out to whoever you can about our cause. We still have Leyna’s Warriors shirts and wristbands available for purchase! Email: leynaswarriors@gmail.com for other options and questions. Mommy and Leyna are off at the epilepsy expo this week. Some sweet lady made Leyna a cute bear. They went to learn more about the different options available for us (so far nothing new) and to learn about other options we have in fundraising to provide Leyna with the life saving help of a service dog. Our donations have seriously slowed down (nothing in the past 8 days) but we are still hopeful and are trying to hit our other avenues hard. This week, mommy will be picking up the T-Shirts that we will be selling and a post will be made showing off those T-Shirts as well as the wrist bands we have available for purchase. Thank you to everyone who has donated and shared but we need more help! Please share this post and get the word out so we can help save our little girls life. After clouds, comes rain... Last night we had to rush our tough little hero to the ER. She had a 33 minute seizure and did not snap out of it nearly as quickly as she normally does. She rarely has seizures more than 12 minutes so a 33 minute seizure for her was very concerning. After consulting her pediatrician, she was rushed the three hours to the ER where we spent the night. After several hours (over 12) and almost being admitted to the PICU (Pediatric ICU), we were moved into a room in the Children's Medical Center. The doctors have ordered a 24 hour EEG so here we sit until tomorrow night. Someone is in good spirits even though she is upset at being wrapped like a mummy and poked and prodded far more often than she would like. Hopefully tomorrow will bring a greater understanding of everything that is happening.